When you have a genuine complaint you will feel angry, but you must show restraint in your letter. 1. Introduction : If possible, begin with positive - you might refer to previous good service, for example. Describe the item or service you bought, or the incident that happened. If appropriate, say where and when you bought the item (or when service carried out). 2. Details : Explain what is wrong, any action you have already taken, to whom you spoke and what happened. This section must be structured logically. 3. Action : You may form a conclusion here with your feelings about the situation. State that you expect to be done to rectify the situation, for example a refund or repair, or the job done again without a charge. Alternatively, you may simple ask the recipients to investigate the matter and take the necessary action. 4. Close : Close with a simple one-liner saying you hope to receive a prompt reply. Note : Confine your complaint to be statements of facts and explain your disappointment rather than showing so much emotion or expressing anger. However, if you are the one who get the complaint, It will provide an opportunity to investigate, to explain, and put things right. In this way goodwill may be preserved. 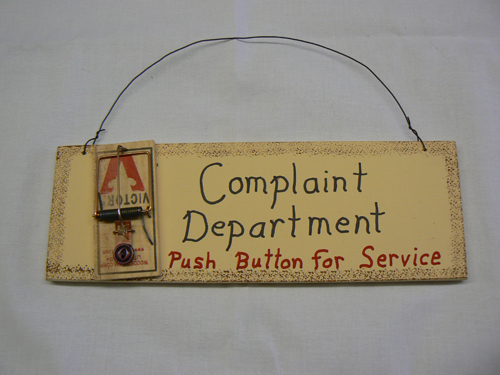 Receiving complaints may also suggest ways in which service or products should be improved. 1. Introduction : Personalise your reply and thank the customer. Explain why you appreciate the complaint, and apologise for what has happened. 2. Details : Acknowledge the customers's point of view. State what action you have taken to fix the things. Keep it simple and specific. 3. Action : Perhaps state what was learned from what happened. Aim to exceed the customer's expectations. It may appropriate to send a small corporate gift or voucher. 4. Close : Close positively..